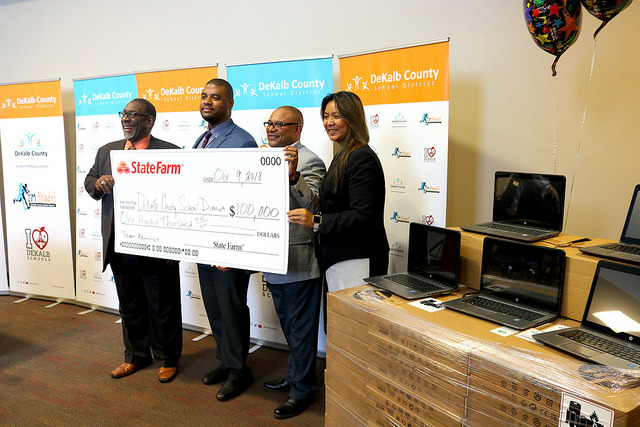 DeKalb County School District (DCSD) celebrated the beginning of an investing, innovative, and inspirational community partnership on October 9, 2018 with State Farm Insurance. State Farm recently awarded DCSD $100,000 in grant funds and 1,200 laptop devices in support of the district’s “I’m Ready!” college and career readiness program. The devices and funds will assist in removing barriers for high school students regarding dual enrollment, online courses, test preparation, transition programs, college and career incentives, and exposure to college campuses. The partnership stems from collaboration between State Farm Insurance and DCSD representatives from the Department of Student Advancement under the Office of Accountability as well as the department of Career, Technical and Agriculture Education (CTAE). DCSD’s track record of increasing accessibility and creating new pathways to college, careers, and the military for students is what caught the attention of State Farm, according to Dr. Green. The “I’m Ready!” initiative will impact all high schools, with an additional layer of support at McNair, Towers, Martin Luther King Jr., Lithonia, and Cross Keys high schools. The laptops will help expand support to DCSD postsecondary centers, parent centers, and help fill other programmatic needs for students and parents. According to Dr. Phillips, the “I’m Ready” campaign will allow every student, regardless of grade level, to imagine and envision a successful future. The accompaniment of technology in the grant, Phillips said, will allow students and parents to see the infrastructural investment from not just DCSD, but the community at large. State Farm AVP for Human Resources, Clarence Hearns, spoke on behalf of all State Farm employees in celebrating the company’s ability to support DCSD’s efforts in education.